In the first months of 2015 alone, 20 thousand Albanians have left the country in an effort to seek economic asylum in Germany. This figure is considered to be serious and Albanian authorities have been set in motion to stop this wave. It’s been officially declared that in the recent days, the number of people who travel for this reason has significantly fallen. However, the departures have not come to a stop. There are suspicions that this is a case of misunderstanding which is being used to abuse with: Germany recently announced that it was ready to accept 45 thousand foreigners, but with different professions and for particular reasons relating to the German economy. In this situation, Albanian political camps also have two different opinions on this issue. The opposition criticizes the government by saying that it’s to be blamed for the deterioration of the state of economy, which encourages Albanians to seek a better life. The majority says that most of those who have left are from areas where the local government is controlled by the opposition. The commune of Shishtavec in Kukes, is becoming empty as a result of the massive departures that are taking place. If in the ‘90s they aimed to move to Tirana, now they want to leave the country. Many of them have left toward Germany. The President of Republic, Bujar Nishani, visited this Sunday the commune of Shishtavec to meet with the residents of the area and local representatives and representatives from the District of Kukes. The scope of this meeting was to talk about the exodus, which has recently emerged. The president expressed his concern “about the massive departures of families coming from this area of Albania, but also from other areas of the country”. He called on people not to leave their homes, villages and cities. The president says that during this visit, he saw “a shaken confidence and a lack of hope”. Based on this, the president called on the government “to immediately leave its offices and be closer to the citizens of the country, heed their concerns and offer solutions for their problems”. The president suggests that “the solution doesn’t come by closing the border, but by giving alternatives and concrete solutions. The head of the state says that he will demand from the PM “to take urgent measures in order to stop this hemorrhage of national scales”. The leader of the opposition, Lulzim Basha says that the massive fleeing has turned into an alarming phenomenon for the country. He blames the government for this situation. He says that the same situation as the one in the ‘90s is being repeated, but according to him, with a slight difference: it’s no longer young people who are fleeing, but entire families. “An old wound is returning as a new drama. Whole families are leaving in search of opportunities for a better life, that they cannot find here. In the past two years, they have lost all hope”. According to Mr. Basha, while the citizens are leaving as a result of the bad governance by Rama and Meta, the prime minister behaves like a tourist, by travelling to Europe every weekend. Minister of Social Welfare, Erion Veliaj suggests that the largest number of people who leave are from municipalities and communes governed by the opposition. Veliaj also accused the heads of the right wing local government of purposely not distributing their social allowances in order to make them leave. The minister, who was also run for mayor of Tirana by the majority, mentions several cases when the payment of social welfare has been delayed for months. Veliaj stops in the communes of Kukes, which have the largest number of Albanian asylum seekers. “For months, communes Surroi, Topojani and Shishtavec have not distributed the social allowance and this is forcing people to leave the country”, Mr. Veliaj says. Meanwhile, the opposition accused him of making things up. Veliaj’s declarations that people are leaving as a result of the opposition, sparked debates in social networks. Some considered this insanity, some immoral and some others groundless. This debate was also joined by analysts who considered this declaration as irresponsible. Prime Minister Rama intervened in order to support Veliaj. He also said that the causes are not current, but inherited: “Why do Albanians leave? It’s an insult for the intelligence of every Albanian to say that what’s happening these weeks is linked to a fall of economy”. Rama says that the same thing is also taking place in Kosovo. “Departures from Kosovo are going down. What’s happening? The economy of Kosovo has changed in the past few weeks? No! People who are encouraged to leave by criminal elements, have been stopped”. The prime minister also stops on this phenomenon and accuses the opposition for abusing with this situation: “The fact that there are poor areas, especially in northeast of the country, the fact that there are people leaving in dire conditions, is undeniable. Nobody has denied this and shame on the opposition for linking this with this government”. Anduel and Odisea are two from many Albanian youngsters who in the recent months have attempted to go to Germany with the hope of being granted asylum. Both of them have failed in their efforts, but they admit that if they are offered a fresh opportunity, they would give it another try. Anduel Ramadani, a 23 year old from Fier, has attended a professional school for carpentry, but could never find work. The young man from Fier reveals how he made his journey to Germany. “From Fier, I took the bus to Greece. I spent a night in a hotel in Athens. We went to the airport and we took the plane to Munich, Germany. We could not find the exit. Police saw us and accompanied us to the station as soon as they learnt that we were Albanians. They held us ten hours there. Then they repatriated us to Albania”. Anduel says that he wanted to seek asylum, but he realized that such thing was impossible, as he didn’t meet the criteria. “They said that we didn’t meet the conditions to apply for asylum. We asked them what the criteria were and they said: You must either be persecuted by Albanian politics or be in a blood feud”. Odisea is a 24 year old man from Vlora. He says that he has been graduated as an environment engineer in Tirana. After university, the only job that he managed to find was as a waiter, four hours a day. Odisea reveals his story which started on St. Valentines day this year. “On February 14, I decided to leave Albania. I took the ferry from Vlora and went to Bari. There I took the train to Milan and then traveled to Switzerland. There, I took another train and went to Hannover, Germany where we asked about the location of the asylum seekers’ camps. We went to the police. There, they took our passports and took us to a camp. 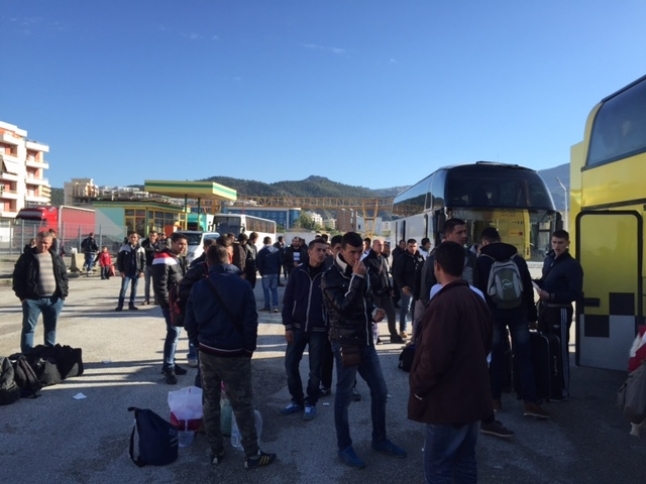 They filled several paperwork for us”, says the 24 year old from Orikum, Vlora. He says that he was on this long journey with another person. “They enrolled us in a language course for a week, where we learned some basic things. It was impossible to find a job.” The young man says that he lived in barracks and that every month, Germany gave him 140 Euros a month in allowance. With this money, he tried to make his ends meet, because food in the canteen was not that great. In the past three months, around 20 thousand people are trying their luck in the most developed countries of the EU, such as Germany, France, Belgium, etc. Half of asylum seekers who go from the Balkan countries to Germany, are Albanians. German ambassador to Tirana, Helmut Hoffman, is intensifying his public appearances to convince Albanians not to try their asylum adventure. He says that Germany doesn’t grant economic asylum. Hoffman visited the customs of Morina in Kukes, which links Albania to Kosovo. Kukes has seen many people leave in the recent months. Mr. Hoffman says that nobody should try such journey, because all of those that have already arrived or will arrive in asylum seekers’ camps, will be sent back within three months. “In the recent months, we have noticed that many Albanian citizens have done this. I must repeat it once again for those people why attempt to leave Albania and seek asylum. All cases will undergo complicated procedures of verification, which generally last two to three months. We have attempted to reduce these procedures, but in the majority of cases and almost in all cases, these citizens will be repatriated. It’s not worthy to stay there for several months and them come back here and start everything over again”. The Albanian government is doing what it can, to hold this phenomenon under control, even by stopping people on the border. State police is fully committed to continue with this process, by applying a process of interrogation in all border crossing points. At the same time, police structures are trying to identify those companies or tour operators that encourage this phenomenon, because among them, there are elements that try to take advantage of the sad fate of people and make money out of it. Interior Minister, Saimir Tahiri says that Albanian citizens must not embark on such adventure, leaving Albania to seek asylum in the European Union countries. According to him, in all cases, this is impossible. “Their departure with the hope to find asylum in the European Union countries is an effort where they spend money and energy and it doesn’t lead to a path for a different future”, the minister says. Tahiri says that not only tour operators, but individuals too are involved in this affair. “We’re working with all state agencies and the government is committed to catch all of those who abuse with Albanian citizens, unjustly promising them in a criminal way a journey in order to seek asylum in the EU countries. This is valid for all tour operators, which if they are identified to be dealing in such activities, will undergo criminal procedures. This also applies to all middlemen, taking people’s money through fraudulent ways and then leaving them at the mercy of fate which in any case, will be repatriated to Albania without being granted asylum in any of the EU countries”.